The most recent financial crisis saw two extremes: several taxpayer-funded bailouts whose pain was felt for years to follow, and one huge disorderly failure that sent global markets spinning like a drunk in a room of fine china. As the drama unfolded, it quickly became clear that globalisation, unadulterated capitalism and a healthy dose of misconduct had changed the face of the modern financial crises forever. That realisation made regulators and policymakers consider that perhaps siloed, national or even regional-level rules are simply not up to the task of protecting or rescuing the global economy in a worst-case scenario. If bank failure on the scale of 2008 is to happen again, readily available tools will need to limit the damage. Regulators globally have spent the best part of 10 years working on the various strands of bank rescue, recovery and rehabilitation. The new European resolution framework, the Bank Recovery and Resolution Directive (BRRD) came into force in January 2016. But resolution tools are a bit like nuclear weapons in that we won’t know if they work, nor how well they work, until they are tested. Cases in Spain and Italy over the summer saw the first test of the Single Resolution Board (SRB); arguably the most important EU institution that most EU citizens have never heard of. Established in 2015 as part of the banking union project, the SRB aims to take the decision of what to do with failing banks away from national competent authorities, which could be inclined to act in the national interest. Its central pillar is the Single Resolution Mechanism (SRM). So as of this year that process has begun – despite what the BRRD puritans might say – but it still has a long way to go before proving especially telling. For instance what would happen if the BRRD had to be used on a global systemically important bank (G-Sib) or even just a D-Sib, the firm that poses a systemic risk on a domestic scale? With this in mind, IFLR Practice Insight spent the summer testing in-house lawyers’ enduring confidence in the European resolution agenda. 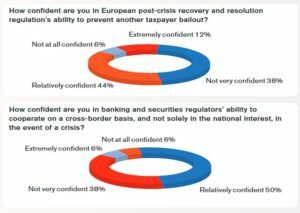 In this landmark poll, we asked them – anonymously – their views on everything from the viability of the BRRD itself and national authorities’ ability to use it, to the bail-in instruments being sold to shore up banks’ balance sheets. Fittingly for a union comprised of nearly 30 countries, little consensus was reached.